Thought to have originated in western Asia, cumin is the second most commercialized spice in the world after black pepper. With a history of use that can be traced back to the ancient Mesopotamia, this biblical seed is now popular worldwide for its distinctive, strong, and aromatic flavor. Cumin has been cultivated since antiquity in Europe and Egypt. It is a popular addition to South Asian, North African, and Latin American cuisines, and it's even found in some cheeses. As a medicinal plant, cumin has traditionally been utilized as an antispasmodic, carminative, sedative, and stimulant with reported antibacterial activity. Reducing inflammation. Cumin also has anti-inflammatory and antioxidant effects to improve rheumatoid arthritis, atherosclerosis, periodontitis, ulcers, and other inflammatory diseases. Supporting gastrointestinal function. 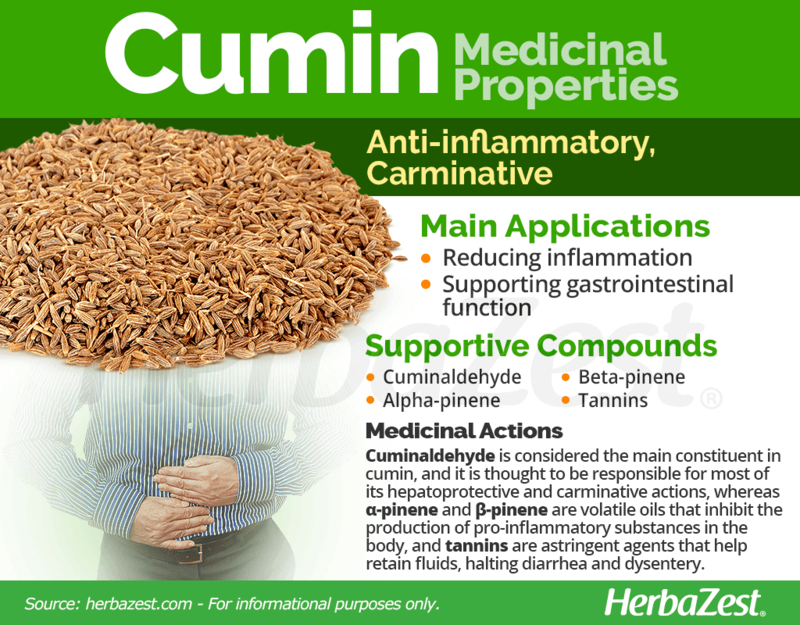 The carminative properties of cumin can help alleviate flatulence, indigestion, bloating, and diarrhea. Healing wounds. Cumin has been shown to encourage tissue regeneration, protect wounds from infections, and reduce bleeding from abrasions. Aiding in healthy liver function. 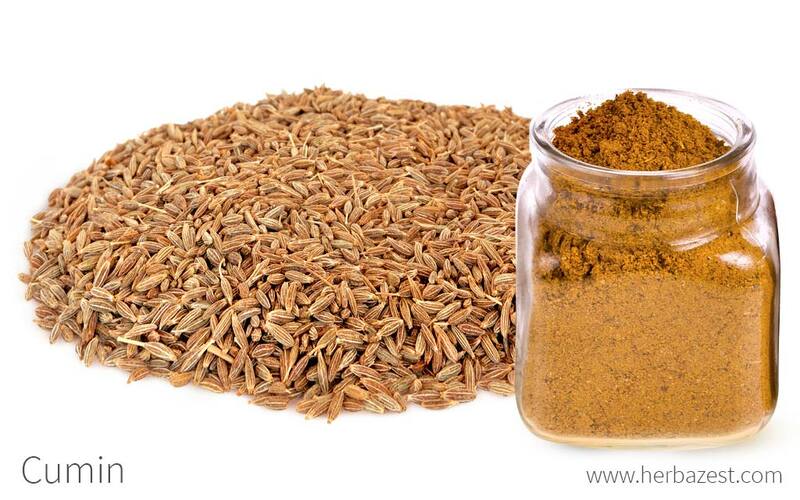 Cumin helps regulate the activity of the liver, thus being useful to treat diseases such as chronic hepatitis. Additionally, in preliminary studies, cumin has shown antihyperlipidemic properties, which may be useful to treat diabetes complications, such as obesity, high cholesterol, and high triglycerides. Cuminaldehyde is considered the main constituent of Cuminum cyminum, and it is thought to be responsible for most of its medicinal benefits. Other phytochemicals in cumin are γ-terpinene, o-cymene, limonene, α-pinene, and β-pinene. The anti-inflammatory activities of cumin have been attributed to its volatile oils, mainly α-pinene and β-pinene. It is thought that these compounds inhibit the production of pro-inflammatory substances in the body, mainly cytokines and prostaglandins, therefore suppressing the inflammatory response in arthritis, rheumatism, and other diseases. 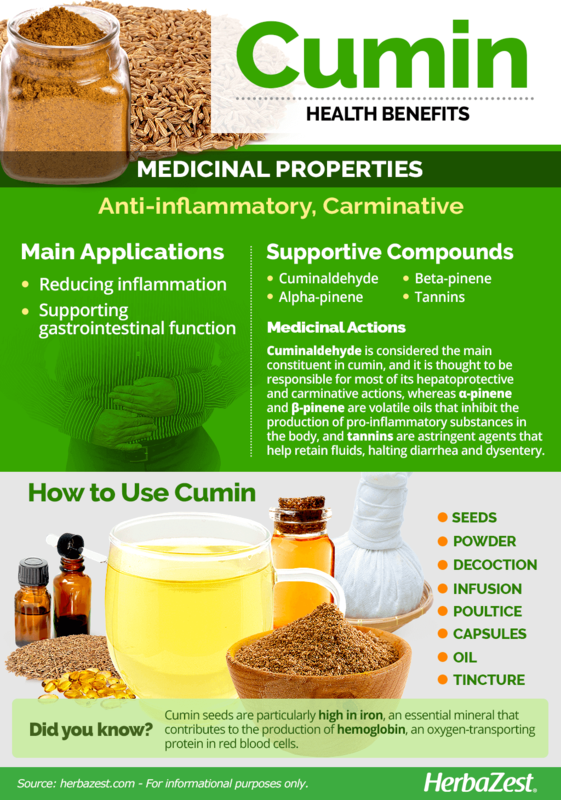 Cumin has long been considered a hepatoprotective and carminative agent. This is because its seeds have the ability to increase stomach acids and bile secretion, which not only aids the digestive process, but also improves liver function. All main compounds of the essential C. cyminum oil have shown strong antimicrobial activity against molds, such as Aspergillus niger; bacteria, such as Bacillus subtilis and Staphylococcus epidermidis; and yeast, such as Saccharomyces cerevisiae and Candida albicans. The phytoconstituents in cumin assist in decreasing the period of epithelialization and inhibiting microbial growth to promote wound healing. The tannins in cumin are astringent agents that tighten and contract human tissue to retain fluid, halting diarrhea and dysentery. Cuminaldehyde has been associated with reduced body weight, cholesterol, phospholipids, free fatty acids, triglycerides, and blood sugar. Other herbs with both anti-inflammatory and carminative properties are allspice, oregano, cardamom, and chamomile. While cumin is generally recognized as safe for human consumption as a condiment and essential oil, excessive amounts of the spice could lead to heartburn, excessive belching, and nausea, as well as skin rashes when applied topically. Since the herb may slow blood clotting and lower blood sugar levels, people taking anticoagulant drugs (blood thinners) and diabetics under medical treatment should consult to a doctor before taking cumin in medicinal doses. Likewise, people due to undergo surgery should avoid cumin use at least two weeks before the scheduled procedure. There is not enough reliable information regarding the safety of cumin for women who are pregnant or nursing, but the spice is traditionally believed to be an emmenagogue, inducing bleeding and premature labor. It is best to stay on the safe side and avoid use. Cumin offers an array of vitamins and minerals which, due to the primary use of this herb as a spice, are provided mostly in trace amounts, nonetheless contributing to enrich the nutritional content of many dishes. Cumin seeds are particularly high in iron, an essential mineral that contributes to the production of hemoglobin, an oxygen-transporting protein in red blood cells. Appropriate levels of iron in the body optimize blood circulation, increase cognitive functioning, and decrease the likelihood of contracting cognitive disorders, such as dementia, as well as anemia related to iron deficiency. Additionally, cumin provides small amounts of manganese, copper, magnesium, and calcium, along negligible portions of many other minerals and vitamins. A teaspoon of cumin seeds (2.1 g) provides 8 calories, as well as 1% of the daily value for protein and dietary fiber, respectively. Cumin is consumed whole, powdered, or as an essential oil in culinary applications and recipes. The characteristic aroma of cumin is caused by cuminaldehydes within the oil, which have a warm, earthy fragrance with a lingering pungency. The flavor is bitter primarily but with a sweet aftertaste. Cumin is used whole, powdered, or as an essential oil as a condiment in cheeses, pickles, sausages, soups, stews, stuffings, rice, and bean dishes, and its is also a flavoring ingredient for liqueurs. Cumin is the key ingredient in various types of curries and chili powders, as well as in Cajun spice mixes. Medicinally, cumin products are utilized to alleviate a variety of health conditions. Seeds. Whole, dried cumin seeds are consumed to support digestion and lactation as well as improve immunity. Cumin seeds also have antimicrobial and antifungal properties to fight against colds, bronchitis, asthma, and skin disorder infections. Powder. Taking powdered cumin is believed to help jumpstart weight loss. Decoction. Traditionally, Arabs drink a cumin decoction of ground lime and cumin seed for colic. Infusion. A cumin infusion made from cumin leaves steeped in vinegar can be consumed for diarrhea, as was performed by the Arabs. Poultice. A poultice of cumin leaves was made by North Africans to put on the nape of the neck for lumps. It was also used by Ethiopians to be applied to skin disorders. Capsules. Cumin seed oil supplements are believed to promote digestive and colon wellness. Oil. 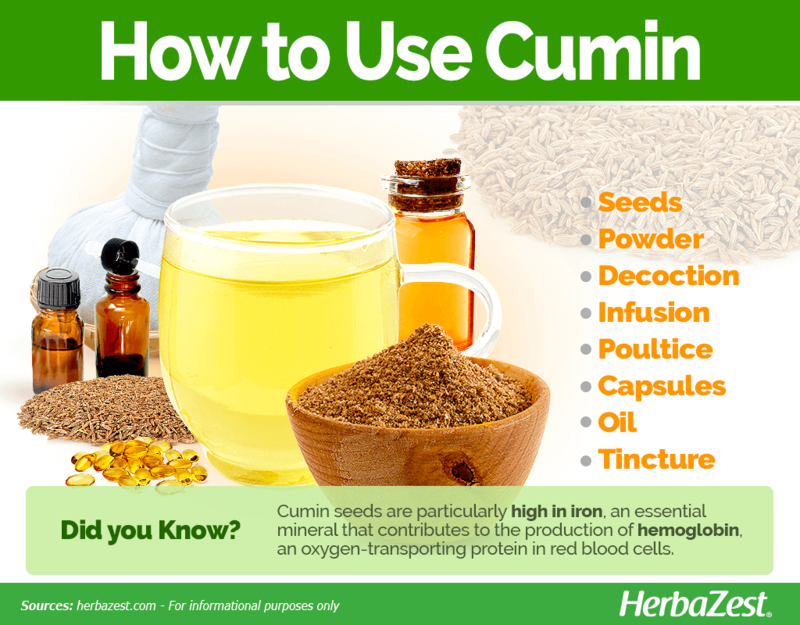 Cumin seed oil is often blended with other oils, such as buckthorn and pumpkin, to support a healthy immune system. Lebanese traditionally use cumin seed oil for cramps, syncope, and tachycardia. Tincture. Cumin tincture is used in efforts to enhance immunity. Whole and ground cumin seed is available year round in grocery stores and supermarkets worldwide. The herb is used extensively in Asian, Middle Eastern, North African, and Western cuisines. Medicinal preparations of cumin, such as capsules, essential oil, and tincture, can be found in herbal shops, specialty health food stores, and online retailers. Cumin is a small annual herb possibly native to the Mediterranean region. It is easy to grow under the right conditions; however, cumin will not tolerate long periods of dry heat and needs mild temperatures, especially during its first three to four months of growing. Cumin tolerates different types of soils, from light sandy to heavy clay loam, as long as they are well-drained. A neutral to alkaline pH of 6.8 - 8.3 is ideal for this herb. It grows best when planted in a sheltered, sunny position, with an optimum temperature range of 63 - 79°F (17 - 26°C). Cumin is typically propagated by seeds, which should be sown directly on previously plowed soil, immediately after the last frost. Since cumin is commonly cultivated in arid and semiarid regions, its water needs are moderate, but care should be taken to keep the soil moist without overwatering it. Cumin is ready to harvest when its fruits become yellow-brown, which usually happens four to five weeks after flowering. Some pests can attack cumin, like aphids, caterpillars, mites, and larvae. Cumin is susceptible to a range of diseases, mostly blight, wilt, and powdery mildew. More detailed information about growing cumin can be found in the herb garden section. Cumin is a small annual herb that grows 6 - 20 inches (15-50 cm) high and has a thin taproot, as well as finely grooved and branched stems that tend to droop. Its leaves are bluish-green, alternated and divided in thread-like segments. The plant is hairless and has a glossy appearance. Inconspicuous white or pink flowers are borne from umbels that are about 1.5 inches (4 cm) in diameter. The fruit is rounded, one to two inches (3-6 cm) in length, and contains two carpels. The seeds inside are yellow-brown and hairy. Cumin is a member of the Apiaceae (Umbelliferae) family, which is comprised of about 300 genera and 3,000 species that are commonly distinguished by their umbellate inflorescences and hollow stems. Notable members of this family are anise (Pimpinella anisum), carrot (Daucus carota), celery (Apium graveolens), dill (Anethum graveolens), fennel (Foeniculum vulgare), and parsley (Petroselinum crispum). 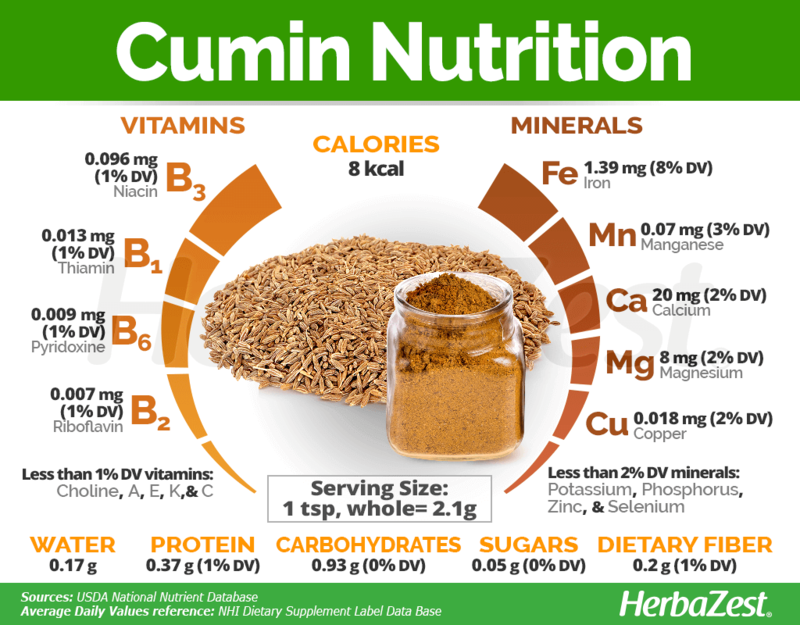 Cuminum cyminum, also known as "green cumin", is the only species in the genus Cuminum. However, it is closely related to other seed spices that also belong to the Apiaceae family, such as: anise (Pimpinella anisum), often called "sweet cumin"; dill (Anethum graveolens), Fennel (Foeniculum vulgare), Caraway (Carum carvi), and Ajwain (Carum copticum). It is important to note that Nigella sativa and Bunium persicum, although both known as 'black cumin', are not related in any way to C. cyminum. Cumin is though to be originated in the eastern Mediterranean region and southwest Asia. The earliest records of cumin cultivation are from the Mesopotamian civilizations, where the fruit of cumin was highly prized as flavoring agent. Its medicinal properties were also valued by the Egyptians, and are mentioned in the Eber Papyrus, dated back to 1550 BCE. The spice was also well-known by the Romans, who used cumin seeds as an alternative to pepper. Cumin is mentioned in the Christian Bible and the Jewish Torah, and remains an essential ingredient of many traditional Mediterranean dishes, particularly in Egypt, Turkey, Israel, Jordan, Lebanon, Palestine, and Syria. It is thought that cumin was introduced to North America by Spanish or Portuguese traders. In Ancient Greece, cumin was associated with cupidity and, by the first century, Roman emperor Marcus Aurelius was nicknamed 'Cumin' because of his extreme greediness. The global production of cumin amounts around 200,000 tonnes. While India, Syria, Turkey, and Iran are major producers of the spice, India is the largest exporter, with around 50,000 tonnes annually (75% of the total production). The U.S., U.K., and Brazil are the leading importers of Indian cumin seeds. Cosmetics. Due to its strongly aromatic properties, cumin's essential oil is used in the cosmetic industry, particularly in perfumery. Veterinary medicine. The healing properties of cumin seeds are also used to treat indigestion, flatulence, and diarrhea in animals. Additionally, cumin's antibacterial action has also been useful against a wide range of bacterial microorganisms responsible for many cultivated mushroom diseases around the world.